Clear Aligners Provide a Less Embarrassing Orthodontic Choice for Teens - Gregory L Palozola D.D.S. P.C. For decades, traditional braces were the only orthodontic choice for moving misaligned teeth. Although they’re quite effective, they can cause discomfort and, for teens especially, embarrassment due to their noticeable metallic appearance. In recent years, though, technology has produced an alternative to braces that’s proven effective for many types of patients. Besides being less cumbersome and disruptive to everyday life than braces, clear aligners have another advantage that appeals to teens — they’re much less visible. 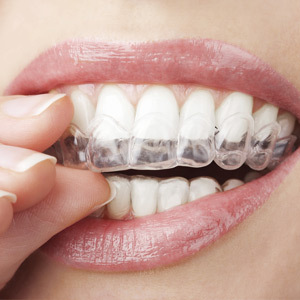 Introduced in the late 1990s, clear aligners are a system of individual trays made of nearly invisible polyurethane plastic worn over the upper teeth. The trays are computer-generated based on the patient’s individual mouth structure captured in photographs and x-rays. Each tray in the sequence is incrementally smaller in size; the patient begins wearing the first aligner in the series for about two weeks, 20 to 22 hours a day. They then switch to the next tray in the series for about the same amount of time, and continue in this fashion until they’ve worn each aligner in the series. Besides their improvement in appearance, aligners also have another advantage: unlike traditional braces, aligners can be removed from the mouth for eating or on a limited basis for rare important social occasions. Brushing and flossing are also much easier with aligners, which don’t pose the same access problems as traditional braces. Clear aligners were once only effective with select types of orthodontic patients, which didn’t always include teens. Over the last decade, however, significant changes to design and additional implements have widened their application to more patients, especially teens. For example, we can now add tiny “power ridges” to the aligner design that give greater precision over desired tooth movement to create a more controlled and efficient force on the teeth. More recent aligners are also being produced with a thinner, more comfortable material. A thorough orthodontic exam will tell whether your teen is a good candidate for clear aligners. If so, they’ll benefit from a more comfortable and less embarrassing experience while gaining a new smile for life.